This article is about the high-tech hub of the Bay Area. For other uses, see Silicon Valley (disambiguation). For the geographical valley, see Santa Clara Valley. Top to bottom: Downtown San Jose skyline; southward aerial view of Silicon Valley; Stanford University in Palo Alto. Silicon Valley is a region in the southern part of the San Francisco Bay Area in Northern California that serves as a global center for high technology, innovation and social media. It corresponds roughly to the geographical Santa Clara Valley. San Jose is the Valley's largest city, the third largest in California, and the tenth largest in the United States. Other major Silicon Valley cities include Palo Alto, Menlo Park, Cupertino, Santa Clara, Mountain View, and Sunnyvale. The San Jose Metropolitan Area has the third highest GDP per capita in the world (after Zurich, Switzerland and Oslo, Norway), according to the Brookings Institution. The word "silicon" in the name originally referred to the large number of silicon chip innovators and manufacturers in the region, but the area is now home to many of the world's largest high-tech corporations, including the headquarters of 39 businesses in the Fortune 1000, and thousands of startup companies. Silicon Valley also accounts for one-third of all of the venture capital investment in the United States, which has helped it to become a leading hub and startup ecosystem for high-tech innovation and scientific development. It was in the Valley that the silicon-based integrated circuit, the microprocessor, and the microcomputer, among other technologies, were developed. As of 2013, the region employed about a quarter of a million information technology workers. As more high-tech companies were established across San Jose and the Santa Clara Valley, and then north towards the Bay Area's two other major cities, San Francisco and Oakland, the "Silicon Valley" has come to have two definitions: a geographic one, referring to Santa Clara County, and a metonymical one, referring to all high-tech businesses in the Bay Area. The term is now generally used as a synecdoche for the American high-technology economic sector. The name also became a global synonym for leading high-tech research and enterprises, and thus inspired similar named locations, as well as research parks and technology centers with a comparable structure all around the world. The popularization of the name is credited to Don Hoefler, who first used it in the article "Silicon Valley USA", appearing in the January 11, 1971 issue of the weekly trade newspaper Electronic News. The term gained widespread use in the early 1980s, at the time of the introduction of the IBM PC and numerous related hardware and software products to the consumer market. For Santa Clara Valley history, see Santa Clara Valley. Silicon Valley was born through several contributing factors intersecting, including a skilled STEM research base housed in area universities, plentiful venture capital, and steady U.S. Department of Defense spending. Stanford University leadership was especially important in the valley's early development. Together these elements formed the basis of its growth and success. On August 23, 1899, the first ship-to-shore wireless telegraph message to be received in the US was from the San Francisco lightship outside the Golden Gate, signaling the return of the American fleet from the Philippines after their victory in the Spanish–American War.[when?] The ship had been outfitted with a wireless telegraph transmitter by a local newspaper, so that they could prepare a celebration on the return of the American sailors. Local historian Clyde Arbuckle states in Clyde Arbuckle's History of San Jose that "California first heard the click of a telegraph key on September 11, 1853. It marked completion of an enterprise begun by a couple of San Francisco Merchants' Exchange members named George Sweeney and Theodore E. Baugh…" He says, "In 1849, the gentleman established a wigwag telegraph station a top a high hill overlooking Portsmouth Squares for signaling arriving ships… The operator at the first station caught these signals by telescope and relayed them to the Merchant's Exchange for the waiting business community." Arbuckle points to the historic significance the Merchants Exchange Building (San Francisco) and Telegraph Hill, San Francisco when he goes on to say "The first station gave the name Telegraph to the hill on which it was located. It was known as the Inner Station; the second, as the Outer Station. Both used their primitive mode of communication until Messrs. Sweeney and Baugh connected the Outer Station directly with the Merchants's Exchange by electric telegraph Wire." According to Arbuckle (p. 380–381) Sweeney and Baugh's line was strictly an intra-city, San Francisco-based service; that is until California State Telegraph Company enfranchised on May 3, 1852; whereas, O.E. Allen and C. Burnham led the way to "build a line from San Francisco to Marysville via San Jose, Stockton, and Sacramento." Delays to construction occurred until September 1853; but, "…San Jose became the first station on the line when the wire arrived here on October 15. The line was completed when [James] Gamble's northbound crew met a similar crew working southward from Marysville on October 24." The Bay Area had long been a major site of United States Navy research and technology. In 1909, Charles Herrold started the first radio station in the United States with regularly scheduled programming in San Jose. Later that year, Stanford University graduate Cyril Elwell purchased the U.S. patents for Poulsen arc radio transmission technology and founded the Federal Telegraph Corporation (FTC) in Palo Alto. Over the next decade, the FTC created the world's first global radio communication system, and signed a contract with the Navy in 1912. In 1933, Air Base Sunnyvale, California, was commissioned by the United States Government for use as a Naval Air Station (NAS) to house the airship USS Macon in Hangar One. The station was renamed NAS Moffett Field, and between 1933 and 1947, U.S. Navy blimps were based there. A number of technology firms had set up shop in the area around Moffett Field to serve the Navy. When the Navy gave up its airship ambitions and moved most of its west coast operations to San Diego, the National Advisory Committee for Aeronautics (NACA, forerunner of NASA) took over portions of Moffett Field for aeronautics research. Many of the original companies stayed, while new ones moved in. The immediate area was soon filled with aerospace firms, such as Lockheed. The Bay Area was an early center of ham radio with about 10% of the operators in the United States. William Eitel, Jack McCullough, and Charles Litton, who together pioneered vacuum tube manufacturing in the Bay Area, were hobbyists with training in technology gained locally who participated in the development of shortwave radio by the ham radio hobby. High frequency, and especially, Very high frequency, VHF, transmission in the 10-meter band, required higher quality power tubes than were manufactured by the consortium of RCA, Western Electric, General Electric, Westinghouse which controlled vacuum tube manufacture. Litton, founder of Litton Industries, pioneered manufacturing techniques which resulted in the award of wartime contracts to manufacture transmitting tubes for radar to Eitel-McCullough, a San Bruno firm, which manufactured power-grid tubes for radio amateurs and aircraft radio equipment. A union organizing drive in 1939–40 at Eitel-McCullough by the strong Bay Area labor movement was fought off by adoption of a strategy of welfare capitalism which included pensions and other generous benefits, profit sharing, and such extras as a medical clinic and a cafeteria. An atmosphere of cooperation and collaboration was established. Successes have been few and far between for union organizing drives by UE and others in subsequent years. On October 4, 1957 the Soviet Union launched the first space satellite, Sputnik, which sparked fear that the Soviet Union was pulling ahead technologically. After President Eisenhower signed the National Aeronautics and Space Act (NASA), he turned to Fairchild Semiconductor,[further explanation needed] then the only company in the world that was able to make transistors. The president funded Fairchild's project,[further explanation needed] which was highly successful. Stanford University, its affiliates, and graduates have played a major role in the development of this area. Some examples include the work of Lee De Forest with his invention of a pioneering vacuum tube called the Audion and the oscilloscopes of Hewlett-Packard. A very powerful sense of regional solidarity accompanied the rise of Silicon Valley. From the 1890s, Stanford University's leaders saw its mission as service to the West and shaped the school accordingly. At the same time, the perceived exploitation of the West at the hands of eastern interests fueled booster-like attempts to build self-sufficient local industry. Thus, regionalism helped align Stanford's interests with those of the area's high-tech firms for the first fifty years of Silicon Valley's development. During the 1940s and 1950s, Frederick Terman, as Stanford's dean of engineering and provost, encouraged faculty and graduates to start their own companies. He is credited with nurturing Hewlett-Packard, Varian Associates, and other high-tech firms, until what would become Silicon Valley grew up around the Stanford campus. Terman is often called "the father of Silicon Valley". In 1956, William Shockley, the creator of the transistor, moved from New Jersey to Mountain View, California, to start Shockley Semiconductor Laboratory to live closer to his ailing mother in Palo Alto. Shockley's work served as the basis for many electronic developments for decades. During 1955–85, solid state technology research and development at Stanford University followed three waves of industrial innovation made possible by support from private corporations, mainly Bell Telephone Laboratories, Shockley Semiconductor, Fairchild Semiconductor, and Xerox PARC. In 1969, the Stanford Research Institute (now SRI International), operated one of the four original nodes that comprised ARPANET, predecessor to the Internet. After World War II, universities were experiencing enormous demand due to returning students. To address the financial demands of Stanford's growth requirements, and to provide local employment opportunities for graduating students, Frederick Terman proposed the leasing of Stanford's lands for use as an office park, named the Stanford Industrial Park (later Stanford Research Park) in the year 1951. Leases were limited to high technology companies. Its first tenant was Varian Associates, founded by Stanford alumni in the 1930s to build military radar components. However, Terman also found venture capital for civilian technology start-ups. One of the major success stories was Hewlett-Packard. Founded in Packard's garage by Stanford graduates William Hewlett and David Packard, Hewlett-Packard moved its offices into the Stanford Research Park shortly after 1953. In 1954, Stanford created the Honors Cooperative Program to allow full-time employees of the companies to pursue graduate degrees from the University on a part-time basis. The initial companies signed five-year agreements in which they would pay double the tuition for each student in order to cover the costs. Hewlett-Packard has become the largest personal computer manufacturer in the world, and transformed the home printing market when it released the first thermal drop-on-demand ink jet printer in 1984. Other early tenants included Eastman Kodak, General Electric, and Lockheed. In 1953, William Shockley left Bell Labs in a disagreement over the handling of the invention of the transistor. After returning to California Institute of Technology for a short while, Shockley moved to Mountain View, California, in 1956, and founded Shockley Semiconductor Laboratory. Unlike many other researchers who used germanium as the semiconductor material, Shockley believed that silicon was the better material for making transistors. Shockley intended to replace the current transistor with a new three-element design (today known as the Shockley diode), but the design was considerably more difficult to build than the "simple" transistor. In 1957, Shockley decided to end research on the silicon transistor. As a result of Shockley's abusive management style, eight engineers left the company to form Fairchild Semiconductor; Shockley referred to them as the "traitorous eight". Two of the original employees of Fairchild Semiconductor, Robert Noyce and Gordon Moore, would go on to found Intel. On April 23, 1963, J.C.R. Licklider, the first director of the Information Processing Techniques Office (IPTO) at The Pentagon's ARPA issued an office memorandum addressed to Members and Affiliates of the Intergalactic Computer Network. It rescheduled a meeting in Palo Alto regarding his vision of a computer network which he imagined as an electronic commons open to all the main and essential medium of informational interaction for governments, institutions, corporations, and individuals. As head of IPTO from 1962 to 1964, "Licklider initiated three of the most important developments in information technology: the creation of computer science departments at several major universities, time-sharing, and networking.” By the late 1960s, his promotion of the concept had inspired a primitive version of his vision called ARPANET, which expanded into a network of networks in the 1970s that became the Internet. The Immigration and Nationality Act of 1965 and other factors such as the mass exodus by Vietnamese boat people resulted in significant immigration, particularly by Asians, Latinos, and Portuguese, to Silicon Valley where they contributed to both the high-tech and production workforce. The Asian-American population in Santa Clara County rose from 43,000 in 1970 to 430,000 in 2000. During the same period the Latino population grew to 24% in the county and 30% in San Jose. The African-American population in the county remained steady but grew slightly to about 5%. Expansion of the H-1B visa in 1990 also played a role. Prior to 1970, most Northern California lawyers were based in San Francisco, especially the experienced patent attorneys whom the high-tech industry needed to protect its intellectual property. During the 1970s, lawyers began to follow venture capitalists down the Peninsula to serve the booming high-tech industry in Silicon Valley. One sign of the rapid expansion of Silicon Valley legal services was that Palo Alto law firm Wilson Sonsini Goodrich & Rosati "expanded from a dozen attorneys in 1975 to more than 700 by 2000." In April 1974, Intel released the Intel 8080, a "computer on a chip", "the first truly usable microprocessor". A microprocessor incorporates the functions of a computer's central processing unit (CPU) on a single integrated circuit (IC). Invitation to first Homebrew Computer Club meeting, 1975. The Homebrew Computer Club was an informal group of electronic enthusiasts and technically minded hobbyists who gathered to trade parts, circuits, and information pertaining to DIY construction of computing devices. It was started by Gordon French and Fred Moore who met at the Community Computer Center in Menlo Park. They both were interested in maintaining a regular, open forum for people to get together to work on making computers more accessible to everyone. The first meeting was held as of March 1975 at French's garage in Menlo Park, San Mateo County, California; which was on occasion of the arrival of the MITS Altair microcomputer, the first unit sent to the area for review by People's Computer Company. Steve Wozniak and Steve Jobs credit that first meeting with inspiring them to design the original Apple I and (successor) Apple II computers. As a result, the first preview of the Apple I was given at the Homebrew Computer Club. Subsequent meetings were held at an auditorium at the Stanford Linear Accelerator Center. By the early 1970s, there were many semiconductor companies in the area, computer firms using their devices, and programming and service companies serving both. Industrial space was plentiful and housing was still inexpensive. Growth during this era was fueled by the emergence of venture capital on Sand Hill Road, beginning with Kleiner Perkins and Sequoia Capital in 1972; the availability of venture capital exploded after the successful $1.3 billion IPO of Apple Computer in December 1980. In 1971 Don Hoefler traced the origins of Silicon Valley firms, including via investments from Fairchild's eight co-founders. The key investors in Kleiner Perkins and Sequoia Capital were from the same group, directly leading to Tech Crunch 2014 estimate of 92 public firms of 130 related listed firms then worth over US$2.1 Trillion with over 2,000 firms traced back to them. Silicon Valley venture capital investment, 2002-2017. Using money from NASA, the US Air Force, and ARPA, Doug Engelbart invented the mouse and hypertext-based collaboration tools in the mid-1960s and 1970s while at Stanford Research Institute (now SRI International), first publicly demonstrated in 1968 in what is now known as The Mother of All Demos. Engelbart's Augmentation Research Center at SRI was also involved in launching the ARPANET (precursor to the Internet) and starting the Network Information Center (now InterNIC). Xerox hired some of Engelbart's best researchers beginning in the early 1970s. In turn, in the 1970s and 1980s, Xerox's Palo Alto Research Center (PARC) played a pivotal role in object-oriented programming, graphical user interfaces (GUIs), Ethernet, PostScript, and laser printers. While Xerox marketed equipment using its technologies, for the most part its technologies flourished elsewhere. 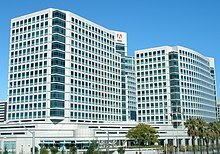 The diaspora of Xerox inventions led directly to 3Com and Adobe Systems, and indirectly to Cisco, Apple Computer, and Microsoft. Apple's Macintosh GUI was largely a result of Steve Jobs' visit to PARC and the subsequent hiring of key personnel. Cisco's impetus stemmed from the need to route a variety of protocols over Stanford University's Ethernet campus network. Commercial use of the Internet became practical and grew slowly throughout the early 1990s. In 1995, commercial use of the Internet grew substantially and the initial wave of internet startups, Amazon.com, eBay, and the predecessor to Craigslist began operations. Silicon Valley is generally considered to have been the center of the dot-com bubble, which started in the mid-1990s and collapsed after the NASDAQ stock market began to decline dramatically in April 2000. During the bubble era, real estate prices reached unprecedented levels. For a brief time, Sand Hill Road was home to the most expensive commercial real estate in the world, and the booming economy resulted in severe traffic congestion. After the dot-com crash, Silicon Valley continues to maintain its status as one of the top research and development centers in the world. A 2006 The Wall Street Journal story found that 12 of the 20 most inventive towns in America were in California, and 10 of those were in Silicon Valley. San Jose led the list with 3,867 utility patents filed in 2005, and number two was Sunnyvale, at 1,881 utility patents. Silicon Valley is also home to a significant number of "Unicorn" ventures, referring to startup companies whose valuation has exceeded $1 billion dollars. Silicon Valley has a social and business ethos that supports innovation and entrepreneurship. Attempts to create "Silicon Valleys" in environments where disruptive innovation does not go over well have a poor track record. The San Francisco Bay Area has the largest concentration of high-tech companies in the United States, at 387,000 high-tech jobs, of which Silicon Valley accounts for 225,300 high-tech jobs. Silicon Valley has the highest concentration of high-tech workers of any metropolitan area, with 285.9 out of every 1,000 private-sector workers. Silicon Valley has the highest average high-tech salary in the United States at $144,800. Largely a result of the high technology sector, the San Jose-Sunnyvale-Santa Clara, CA Metropolitan Statistical Area has the most millionaires and the most billionaires in the United States per capita. The region is the biggest high-tech manufacturing center in the United States. The unemployment rate of the region was 9.4% in January 2009, up from 7.8% in the previous month. Silicon Valley received 41% of all U.S. venture investment in 2011, and 46% in 2012. More traditional industries also recognize the potential of high-tech development, and several car manufacturers have opened offices in Silicon Valley to capitalize on its entrepreneurial ecosystem. Manufacture of transistors is, or was, the core industry in Silicon Valley. The production workforce was for the most part composed of Asian and Latino immigrants who were paid low wages and worked in hazardous conditions due to the chemicals used in the manufacture of integrated circuits. Technical, engineering, design, and administrative staffs were in large part well compensated. Silicon Valley has a severe housing shortage, caused by the market imbalance between jobs created and housing units built: from 2010 to 2015, many more jobs have been created than housing units built. (400,000 jobs, 60,000 housing units) This shortage has driven home prices extremely high, far out of the range of production workers. As of 2016 a two-bedroom apartment rented for about $2,500 while the median home price was about $1 million. The Financial Post called Silicon Valley the most expensive U.S. housing region. 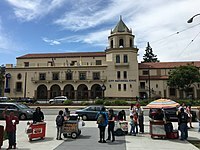 Homelessness is a problem with housing beyond the reach of middle-income residents; there is little shelter space other than in San Jose which, as of 2015, was making an effort to develop shelters by renovating old hotels. The Economist also attributes the high cost of living to the success of the industries in this region. Although, this rift between high and low salaries is driving many residents out who can no longer afford to live there. In the Bay Area, the number of residents planning to leave within the next several years has had an increase of 12% since 2016, from 34% to 46%. Depending on what geographic regions are included in the meaning of the term, the population of Silicon Valley is between 3.5 and 4 million. A 1999 study by AnnaLee Saxenian for the Public Policy Institute of California reported that a third of Silicon Valley scientists and engineers were immigrants and that nearly a quarter of Silicon Valley's high-technology firms since 1980 were run by Chinese (17 percent) or Indian CEOs (7 percent). There is a stratum of well-compensated technical employees and managers, including 10s of thousands of "single-digit millionaires." This income and range of assets will support a middle-class lifestyle in Silicon Valley. Exotic cars outside the Hotel Valencia, in Santana Row, San Jose. Silicon Valley tech leadership positions are occupied almost exclusively by men. This is also represented in the number of new companies founded by women as well as the number of women-lead startups that receive venture capital funding. Wadhwa said he believes that a contributing factor is a lack of parental encouragement to study science and engineering. He also cited a lack of women role models and noted that most famous tech leaders—like Bill Gates, Steve Jobs, and Mark Zuckerberg—are men. In 2014, tech companies Google, Yahoo!, Facebook, Apple, and others, released corporate transparency reports that offered detailed employee breakdowns. In May, Google said 17% of its tech employees worldwide were women, and, in the U.S., 1% of its tech workers were black and 2% were Hispanic. June 2014 brought reports from Yahoo! and Facebook. Yahoo! said that 15% of its tech jobs were held by women, 2% of its tech employees were black and 4% Hispanic. Facebook reported that 15% of its tech workforce was female, and 3% was Hispanic and 1% was black. In August, Apple reported that 80% of its global tech staff was male and that, in the U.S., 54% of its tech jobs were staffed by Caucasians and 23% by Asians. Soon after, USA Today published an article about Silicon Valley's lack of tech-industry diversity, pointing out that it is largely white or Asian, and male. "Blacks and Hispanics are largely absent," it reported, "and women are underrepresented in Silicon Valley—from giant companies to start-ups to venture capital firms." Civil rights activist Jesse Jackson said of improving diversity in the tech industry, "This is the next step in the civil rights movement" while T.J. Rodgers has argued against Jackson's assertions. As of October 2014, some high-profile Silicon Valley firms were working actively to prepare and recruit women. Bloomberg reported that Apple, Facebook, Google, and Microsoft attended the 20th annual Grace Hopper Celebration of Women in Computing conference to actively recruit and potentially hire female engineers and technology experts. The same month, the second annual Platform Summit was held to discuss increasing racial and gender diversity in tech. As of April 2015 experienced women were engaged in creation of venture capital firms which leveraged women's perspectives in funding of startups. After UC Davis published its Study of California Women Business Leaders in November 2006, some San Jose Mercury News readers dismissed the possibility that sexism contributed in making Silicon Valley's leadership gender gap the highest in the state. A January 2015 issue of Newsweek magazine featured an article detailing reports of sexism and misogyny in Silicon Valley. The article's author, Nina Burleigh, asked, "Where were all these offended people when women like Heidi Roizen published accounts of having a venture capitalist stick her hand in his pants under a table while a deal was being discussed?" Silicon Valley firms' board of directors are composed of 15.7% women compared with 20.9% in the S&P 100. The 2012 lawsuit Pao v. Kleiner Perkins was filed in San Francisco County Superior Court by executive Ellen Pao for gender discrimination against her employer, Kleiner Perkins. The case went to trial in February 2015. On March 27, 2015 the jury found in favor of Kleiner Perkins on all counts. Nevertheless, the case, which had wide press coverage, resulted in major advances in consciousness of gender discrimination on the part of venture capital and technology firms and their women employees. Two other cases have been filed against Facebook and Twitter. Funding for public schools in upscale Silicon Valley communities such as Woodside is often supplemented by grants from private foundations set up for that purpose and funded by local residents. Schools in less affluent areas such as East Palo Alto must depend on state funding. Map visualization of traditional Silicon Valley in red (bottom), San Francisco in maroon (left), and the Berkeley tech cluster in peach (right). The geographical boundaries of Silicon Valley have changed over the years, traditionally Silicon Valley is known as Santa Clara County, southern San Mateo County and southern Alameda county. However, over the years this geographical area has been expanded to include San Francisco County, Contra Costa County, and the northern parts of Alameda County and San Mateo County, this shift has occurred due to the expansion in the local economy and the development of new technologies. The United States Department of Labor's Quarterly Census of Employment and Wages (QCEW) program defined Silicon Valley as the counties of Alameda, Contra Costa, San Francisco, San Mateo, Santa Clara, and Santa Cruz. In 2015, MIT researchers developed a novel method for measuring which towns are home to startups with higher growth potential and this defines Silicon Valley to center on the municipalities of Menlo Park, Mountain View, Palo Alto, and Sunnyvale. San José State University is the oldest public university on the West Coast and one of the largest feeder schools for Silicon Valley. 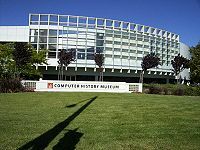 The San Jose Museum of Art (top), The Tech Museum of Innovation (middle), both in San Jose, and the Computer History Museum, in Mountain View. 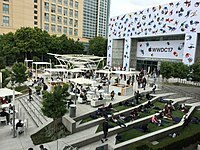 The 2017 Apple Worldwide Developers Conference & Facebook F8 2017, at the San Jose Convention Center. Silicon Valley's art gallery, Pace Art and Technology Gallery in Menlo Park, opened on February 6, 2016. In 1928, the Allied Arts Guild was formed in Menlo Park and is a complex of artist studios, shops, restaurant, and gardens. In 1980, Intelligent Machines Journal -a hobbyist journal- changed its name to InfoWorld, and, with offices in Palo Alto, began covering the emergence of the microcomputer industry in the valley. Local and national media cover Silicon Valley and its companies. CNN, The Wall Street Journal, and Bloomberg News operate Silicon Valley bureaus out of Palo Alto. Public broadcaster KQED (TV) and KQED-FM, as well as the Bay Area's local ABC station KGO-TV, operate bureaus in San Jose. KNTV, NBC's local Bay Area affiliate "NBC Bay Area", is located in San Jose. Produced from this location is the nationally distributed TV Show "Tech Now" as well as the CNBC Silicon Valley bureau. San Jose-based media serving Silicon Valley include the San Jose Mercury News daily and the Metro Silicon Valley weekly. Specialty media include El Observador and the San Jose / Silicon Valley Business Journal. Most of the Bay Area's other major TV stations, newspapers, and media operate in San Francisco or Oakland. Patch.com operates various web portals, providing local news, discussion and events for residents of Silicon Valley. Mountain View has a public nonprofit station, KMVT-15. KMVT-15's shows include Silicon Valley Education News (EdNews)-Edward Tico Producer. A View to a Kill—1985 film from the James Bond series. Bond thwarts an elaborate ploy by the film's antagonist, Max Zorin, to destroy Silicon Valley. See also: the categories Companies based in Silicon Valley, Silicon Valley people, and Tourist attractions in Silicon Valley. ^ Orma, Stephanie (14 November 2018). "How Silicon Valley's New Luxury Park James Hotel Got Its Personality". Forbes. Retrieved 29 November 2018. ^ "Monthly employment continues upward climb". Silicon Valley Index. Archived from the original on September 24, 2013. Retrieved September 24, 2013. ^ Castells, Manuel (2011). The Rise of the Network Society. John Wiley & Sons. p. 52. ISBN 978-1-4443-5631-1. ^ Leffingwell, Pamela Welty, Randy (2010). Lighthouses of the Pacific Coast. Voyageur Press. ISBN 9781610604383. ^ Morgan, Jane (1967). Electronics in the West: The First Fifty Years. National Press Books. p. 18. ^ Arbuckle, Clyde (1986). Clyde Arbuckle's History of San Jose. San Jose, CA: Memorabilia of San Jose. p. 380. ^ Sturgeon, Timothy J. (2000). "How Silicon Valley Came to Be". In Kenney, Martin. Understanding Silicon Valley: The Anatomy of an Entrepreneurial Region. Stanford University. ISBN 978-0-8047-3734-0. ^ Black, Dave. "Moffett Field History". moffettfieldmuseum.org. Archived from the original on April 6, 2005. Retrieved April 19, 2015. ^ Christophe Lécuyer (August 24, 2007). Making Silicon Valley: Innovation and the Growth of High Tech, 1930–1970. The MIT Press. pp. 13–40. ISBN 978-0-262-62211-0. ^ Christophe Lécuyer (August 24, 2007). Making Silicon Valley: Innovation and the Growth of High Tech, 1930–1970. The MIT Press. pp. 40, 41. ISBN 978-0-262-62211-0. ^ David Bacon (January 17, 1993). "Silicon Valley on Strike! Immigrants in Electronics Protest Growing Sweat-Shop Conditions". dbacon.igc.org. Archived from the original on March 3, 2016. Retrieved February 3, 2015. ^ "Timeline.Silicon Valley.American Experience.WGBH – PBS". American Experience. Archived from the original on April 17, 2015. Retrieved April 19, 2015. ^ Markoff, John (April 17, 2009). "Searching for Silicon Valley". The New York Times. The New York Times Company. Archived from the original on April 29, 2011. Retrieved April 17, 2009. ^ Tajnai, Carolyn (May 1985). "Fred Terman, the Father of Silicon Valley". Stanford Computer Forum. Carolyn Terman. Archived from the original on December 11, 2014. Retrieved December 10, 2014. ^ "History of Computing Industrial Era 1984–1985". thocp.net. Archived from the original on April 28, 2015. Retrieved April 19, 2015. ^ "The Stanford Research Park: The Engine of Silicon Valley". PaloAltoHistory.com. Archived from the original on March 29, 2014. Retrieved March 29, 2014. ^ Goodheart, Adam (July 2, 2006). "10 Days That Changed History". The New York Times. Archived from the original on September 2, 2017. ^ McLaughlin, John; Weimers, Leigh; Winslow, Ward (2008). Silicon Valley: 110 Year Renaissance. Silicon Valley Historical Association. ISBN 978-0-9649217-4-0. Archived from the original on April 2, 2015. ^ Licklider, J. C. R. (April 23, 1963). "Topics for Discussion at the Forthcoming Meeting, Memorandum For: Members and Affiliates of the Intergalactic Computer Network". Washington, D.C.: Advanced Research Projects Agency, via KurzweilAI.net. Archived from the original on January 23, 2013. Retrieved January 26, 2013. ^ Leiner, Barry M.; et al. (December 10, 2003). ""Origins of the Internet" in A Brief History of the Internet version 3.32". The Internet Society. Archived from the original on June 4, 2007. Retrieved November 3, 2007. ^ a b Garreau, Joel (2006). Radical Evolution: The Promise and Peril of Enhancing Our Minds, Our Bodies—and what it Means to be Human. Broadway. p. 22. ISBN 978-0-7679-1503-8. ^ a b "Defense Advanced Research Projects Agency (DARPA) (United States Government)". Encyclopædia Britannica. Encyclopædia Britannica, Inc. Archived from the original on January 11, 2014. Retrieved January 11, 2014. ^ Glenda Matthews (November 20, 2002). "5. "New Immigrants and Silicon Valley:Struggles, Successes, and Transformations"". Silicon Valley, Women, and the California Dream: Gender, Class, and Opportunity in the Twentieth Century (1 ed.). Stanford, California: Stanford University Press. pp. 147–182. ISBN 978-0-8047-4796-7. Archived from the original on January 16, 2015. Retrieved January 16, 2015. ^ Glenda Matthews (November 20, 2002). Silicon Valley, Women, and the California Dream: Gender, Class, and Opportunity in the Twentieth Century (1 ed.). Stanford, California: Stanford University Press. p. 150. ISBN 978-0-8047-4796-7. Archived from the original on January 16, 2015. Retrieved January 16, 2015. ^ Glenda Matthews (November 20, 2002). Silicon Valley, Women, and the California Dream: Gender, Class, and Opportunity in the Twentieth Century (1 ed.). Stanford, California: Stanford University Press. p. 151. ISBN 978-0-8047-4796-7. Archived from the original on January 16, 2015. Retrieved January 16, 2015. ^ Adams, Stephen B.; Chambers, Dustin; Schultz, Michael (2018). "A moving target: The geographic evolution of Silicon Valley, 1953–1990". Business History. 60 (6): 859–883. doi:10.1080/00076791.2017.1346612. ^ "Homebrew And How The Apple Came To Be". atariarchives.org. Archived from the original on April 7, 2015. Retrieved April 19, 2015. ^ Markoff, John (2006) . What the Dormouse Said: How the Sixties Counterculture Shaped the Personal Computer Industry. Penguin Books. ISBN 978-0-14-303676-0. ^ Wozniak, Steve (2006). iWoz. W.W. Norton & Company. p. 150. ISBN 978-0-393-33043-4. After my first meeting, I started designing the computer that would later be known as the Apple I. It was that inspiring. ^ Freiberger, Paul; Swaine, Michael (2000) . Fire in the Valley: The Making of the Personal Computer. McGraw-Hill. ISBN 978-0-07-135895-8. ^ John K. Waters (2002). John Chambers and the Cisco Way: Navigating Through Volatility. John Wiley & Sons. p. 28. ISBN 9780471273554. ^ W. Josephujjwal sarkar Campbell (January 2, 2015). "The Year of the Internet". 1995: The Year the Future Began. University of California Press. ISBN 978-0-520-27399-3. ^ Reed Albergotti, "The Most Inventive Towns in America", Archived December 3, 2017, at the Wayback Machine Wall Street Journal, July 22–23, 2006, P1. ^ "The Unicorn List". Fortune. January 22, 2015. Archived from the original on April 11, 2015. Retrieved April 6, 2015. ^ "Cybercities 2008: An Overview of the High-Technology Industry in the Nation's Top 60 Cities". aeanet.org. Retrieved April 19, 2015. ^ Albanesius, Chloe (June 24, 2008). "AeA Study Reveals Where the Tech Jobs Are". PC Magazine. Archived from the original on January 12, 2018. ^ Pimentel, Benjamin. "Silicon Valley and N.Y. still top tech rankings". MarketWatch. Archived from the original on December 10, 2008. Retrieved April 19, 2015. ^ "Silicon Valley unemployment rate jumps to 9.4 percent". mercurynews.com. Archived from the original on November 5, 2014. Retrieved April 19, 2015. ^ "Venture Capital Survey Silicon Valley Fourth Quarter 2011". Fenwick.com. Archived from the original on May 14, 2013. Retrieved July 8, 2013. ^ "Porsche lands in Silicon Valley to develop sportscars of the future". IBI. May 8, 2017. Archived from the original on May 13, 2017. Retrieved May 8, 2017. Carmakers who have recently expanded to Silicon Valley include Volkswagen, Hyundai, General Motors, Ford, Honda, Toyota, BMW, Nissan and Mercedes-Benz. ^ "Production Occupations (Major Group)". bls.gov. Bureau of Labor Statistics. May 2014. Archived from the original on March 20, 2015. Retrieved April 25, 2015. ^ Glenda Matthews (November 20, 2002). Silicon Valley, Women, and the California Dream: Gender, Class, and Opportunity in the Twentieth Century (1 ed.). Stanford, California: Stanford University Press. pp. 154–56. ISBN 978-0-8047-4796-7. Archived from the original on January 16, 2015. Retrieved January 16, 2015. ^ "Occupational Employment Statistics Semiconductor and Other Electronic Component Manufacturing". bls.gov. Bureau of Labor Statistics. May 2014. Archived from the original on May 5, 2015. Retrieved April 25, 2015. ^ a b Eliot Brown (June 7, 2016). "Neighbors Clash in Silicon Valley Job growth far outstrips housing, creating an imbalance; San Jose chafes at Santa Clara". The Wall Street Journal. Archived from the original on June 7, 2016. Retrieved June 7, 2016. ^ Glenda Matthews (November 20, 2002). Silicon Valley, Women, and the California Dream: Gender, Class, and Opportunity in the Twentieth Century (1 ed.). Stanford, California: Stanford University Press. p. 233. ISBN 978-0-8047-4796-7. Archived from the original on January 16, 2015. Retrieved January 16, 2015. ^ Monica Potts (December 13, 2015). "Dispossessed in the Land of Dreams: Those left behind by Silicon Valley's technology boom struggle to stay in the place they call home". The New Republic. Archived from the original on December 14, 2015. Retrieved December 14, 2015. A 2013 census showed Santa Clara County having more than 7,000 homeless people, the fifth-highest homeless population per capita in the country and among the highest populations sleeping outside or in unsuitable shelters like vehicles. ^ "Silicon Valley is changing, and its lead over other tech hubs narrowing". The Economist. Retrieved September 5, 2018. ^ "Why startups are leaving Silicon Valley". The Economist. Retrieved September 7, 2018. ^ Kron4 – Palo Alto Ranks No. 5 as Most Educated in the U.S.
^ Saxenian, AnnaLee (1999). "Silicon Valley's New Immigrant Entrepreneurs" (PDF). Public Policy Institute of California. Archived (PDF) from the original on January 31, 2016. ^ "Women Missing From Decision-Making Roles in State Biz" (Press release). UC Regents. November 16, 2006. Retrieved March 25, 2015. ^ a b c Ellis, Katrina (2006). "UC Davis Study of California Women Business Leaders" (PDF). UC Regents. Archived (PDF) from the original on April 2, 2015. Retrieved March 25, 2015. ^ Zee, Samantha (November 16, 2006). "California, Silicon Valley Firms Lack Female Leaders (Update1)". Bloomberg L.P. Archived from the original on April 2, 2015. Retrieved March 25, 2015. ^ a b Wadhwa, Vivek (November 9, 2011). "Silicon Valley women are on the rise, but have far to go". Washington Post. Retrieved December 26, 2014. This is one of Silicon Valley's most glaring faults: It is male-dominated. ^ Wadhwa, Vivek (May 15, 2010). "Fixing Societal Problems: It Starts With Mom and Dad". TechCrunch. AOL. Archived from the original on December 27, 2014. Retrieved December 26, 2014. ^ Musil, Steven (May 28, 2014). "Google discloses its diversity record and admits it's not good". CNET. CBS Interactive. Archived from the original on March 4, 2016. ^ Levy, Karyne (June 17, 2014). "Yahoo's Diversity Numbers Are Just As Terrible As The Rest of the Tech Industry's". Business Insider. Archived from the original on April 2, 2015. Retrieved March 24, 2015. ^ Williams, Maxine (June 25, 2014). "Building a More Diverse Facebook". Facebook. Archived from the original on March 23, 2015. Retrieved March 24, 2015. ^ "Apple diversity report released; Cook 'not satisfied with the numbers'". CBS Interactive. Associated Press. August 13, 2014. Archived from the original on January 26, 2016. ^ Guynn, Jessica; Weise, Elizabeth (August 15, 2014). "Lack of diversity could undercut Silicon Valley". USA Today. Archived from the original on April 17, 2015. Retrieved March 24, 2015. ^ Koch, Wendy (August 15, 2014). "Jesse Jackson: Tech diversity is next civil rights step". USA Today. Archived from the original on March 3, 2015. Retrieved March 24, 2015. ^ Burrows, Peter (October 8, 2014). "Gender Gap Draws Thousands From Google, Apple to Phoenix". Bloomberg Business. Bloomberg. Archived from the original on April 2, 2015. Retrieved March 24, 2015. ^ Porter, Jane (October 29, 2014). "Inside the Movement That's Trying to Solve Silicon Valley's Diversity Problem". Fast Company. Mansueto Ventures. Archived from the original on March 19, 2015. Retrieved March 24, 2015. ^ "Ellen Pao gender discrimination trial grips Silicon Valley". TheGuardian.com. March 13, 2015. Archived from the original on June 17, 2016. Retrieved June 6, 2016. ^ Liz Gannes and Nellie Bowles (March 27, 2015). "Live: Ellen Pao Loses on All Claims in Historic Gender Discrimination Lawsuit Against Kleiner Perkins". Re/code. Archived from the original on March 27, 2015. Retrieved March 27, 2015. That's the full verdict. No on all claims. ^ Sue Decker (March 26, 2015). "A Fish Is the Last to Discover Water: Impressions From the Ellen Pao Trial". Re/code. Archived from the original on March 27, 2015. Retrieved March 28, 2015. We may look back at this as a watershed moment—regardless of how the very attentive jury comes out on their verdict. ^ Streitfeld, David (March 27, 2015). "Ellen Pao Loses Silicon Valley Gender Bias Case Against Kleiner Perkins". The New York Times. Archived from the original on March 31, 2015. Retrieved April 1, 2015. In a sign that the struggle over the place of women in Silicon Valley is only beginning, gender discrimination suits have recently been filed against two prominent companies, Facebook and Twitter. ^ George Packer (May 27, 2013). "Change the World Silicon Valley transfers its slogans—and its money—to the realm of politics". The New Yorker. Archived from the original on July 29, 2015. Retrieved July 30, 2015. In wealthy districts, the public schools have essentially been privatized; they insulate themselves from shortfalls in state funding with money raised by foundations they have set up for themselves. ^ a b O'Brien, Chris (April 19, 2012). "Welcome to the new and expanded Silicon Valley". The Mercury News. Retrieved April 10, 2018. After years of drawing a sharp circle that included Santa Clara County as well as southern San Mateo and Alameda counties, this newspaper is expanding the geographic boundaries that it considers to be part of Silicon Valley to include the five core Bay Area counties: Santa Clara, San Mateo, San Francisco, Alameda and Contra Costa. ^ Malone, Michael S. (June 5, 2013). "Silicon Valley's Newest Address? Look East". Forbes. Retrieved April 10, 2018. which contains Contra Costa County, has already had its Silicon Valley growth boom, fueled in large part by the dot.com bubble of the Nineties. ^ "High-tech employment in Silicon Valley, 2001 and 2008". U.S. Bureau of Labor Statistics. September 8, 2009. Retrieved April 10, 2018. In this analysis, Silicon Valley is defined as Alameda, Contra Costa, San Francisco, San Mateo, Santa Clara, and Santa Cruz counties, in California. ^ Stern, Scott, Guzman, Jorge. Nowcasting and Placecasting Growth Entrepreneurship Archived March 4, 2016, at the Wayback Machine. ^ "Science Magazine: Sign In". sciencemag.org. Archived from the original on March 15, 2015. Retrieved April 19, 2015. ^ Bowles, Nellie (February 6, 2016). "The 'cultural desert' of Silicon Valley finally gets its first serious art gallery". The Guardian. ISSN 0261-3077. Archived from the original on February 21, 2016. Retrieved February 21, 2016. ^ "Barn Woodshop: Menlo Park furniture repair shop is a remnant of a bygone era". San Jose Mercury News. Archived from the original on March 10, 2016. Retrieved February 21, 2016. ^ "Saturday: Allied Arts Guild holds open house". Almanac News. Archived from the original on March 7, 2016. Retrieved February 21, 2016. ^ a b c "14 Sights You Must See in Silicon Valley". Business Insider. Archived from the original on March 20, 2016. Retrieved February 21, 2016. ^ "Arts & Wine Festival". Downtown Los Altos. Retrieved November 3, 2017. ^ "Events". Mountain View Downtown Guide. Retrieved February 22, 2016. ^ "Festival of the Arts". Palo Alto Chamber of Commerce. Retrieved February 22, 2016. ^ John Markoff (September 1999). Foreword, Fire in the Valley (Updated ed.). McGraw-Hill. pp. xi–xiii. ISBN 978-0-07-135892-7. ^ "A View to a Kill (1985) - Plot". IMDB. Archived from the original on April 2, 2019. Retrieved April 2, 2019. ^ "Start-Ups:Silicon Valley". IMDB. Archived from the original on March 24, 2016. Retrieved March 30, 2016. ^ "Betas". IMDB. Archived from the original on April 3, 2016. Retrieved March 30, 2016. Bronson, Po (2013). The Nudist on the Lateshift: and Other Tales of Silicon Valley. Random House. ISBN 978-1-4481-8964-9. Cringely, Robert X. (1996) . Accidental Empires: How the boys of Silicon Valley make their millions, battle foreign competition, and still can't get a date. HarperCollins. ISBN 978-0-88730-855-0. English-Lueck, June Anne (2002). Cultures@Silicon Valley. Stanford University Press. ISBN 978-0-8047-4429-4. Hayes, Dennis (1990) . Behind the Silicon Curtain: The Seductions of Work in a Lonely Era. Black Rose Books. ISBN 978-0-921689-62-1. Kaplan, David A. (2000). The Silicon Boys: And Their Valleys Of Dreams. HarperCollins. ISBN 978-0-688-17906-9. Koepp, Rob (2003-04-11). Clusters of Creativity: Enduring Lessons on Innovation and Entrepreneurship from Silicon Valley and Europe's Silicon Fen. John Wiley & Sons. ISBN 978-0-470-85566-9. Lécuyer, Christophe Lécuyer (2006) . Making Silicon Valley: Innovation and the Growth of High Tech, 1930–1970. Chemical Heritage Foundation. ISBN 978-0-262-12281-8. Levy, Steven (2014) . Hackers: Heroes of the Computer Revolution. O'Reilly Media. ISBN 978-1-4493-8839-3. O'Mara, Margaret Pugh (2015) . Cities of Knowledge: Cold War Science and the Search for the Next Silicon Valley: Cold War Science and the Search for the Next Silicon Valley. Princeton University Press. ISBN 978-1-4008-6688-5. Pellow, David N; Park, Lisa Sun-Hee (2002). The Silicon Valley of Dreams: Environmental Injustice, Immigrant Workers, and the High-tech Global Economy. New York University Press. ISBN 978-0-8147-6710-8. Saxenian, AnnaLee (1996). Regional Advantage: Culture and Competition in Silicon Valley and Route 128. Harvard University Press. ISBN 978-0-674-75340-2. Scoville, Thomas (2001). Silicon Follies (Fiction). Simon & Schuster. ISBN 978-0-7434-1945-1. Whiteley, Carol; McLaughlin, John (2002). Technology, Entrepreneurs and Silicon Valley. Silicon Valley Historical Association. ISBN 978-0-9649217-1-9. Kantor, Jodi (December 23, 2014). "A Brand New World in Which Men Ruled". The New York Times. Koenig, Neil (February 9, 2014). "Next Silicon Valleys: How did California get it so right?". BBC News. Malone, Michael S. (January 30, 2015). "The Purpose of Silicon Valley". MIT Technology Review. Norr, Henry (December 27, 1999). "Growth of a Silicon Empire". San Francisco Chronicle. Palmer, Barbara (February 4, 2004). "Red tile roofs in Bangalore: Stanford's look copied in Silicon Valley and beyond". Stanford Report. Schulz, Thomas (March 4, 2015). "Tomorrowland: How Silicon Valley Shapes Our Future". Der Spiegel. Sturgeon, Timothy J. (December 2000). "Chapter Two: How Silicon Valley Came to Be" (PDF). Industrial Performance Center. Massachusetts Institute of Technology. Silicon Valley: A Five Part Series (DVD). Narrated by Leonard Nimoy. Silicon Valley Historical Association. 2012. "A Weekend in Silicon Valley". The New York Times (Slideshow). August 27, 2010. Wikivoyage has a travel guide for Silicon Valley.